Alex Māzers’s small cottage in south Devon, England is filled with beautifully framed old photographs of her Latvian ancestors; the surface of her writing desk in the living room is crammed with black-and-white portraits of family members from Latvia, encased in ornate decorative frames. Her hallway and kitchen are full of items she has brought back from her recent trips to Latvia: there are sweets, chocolates and teas from Latvia in her kitchen, books about Latvian history and culture in the hallway bookcase, and in her bedroom are two large paintings, gifted to her on her recent trip to Latvia by her father’s cousin, Baiba, who is a talented artist and member of the Latvian Union of Artists. A gift for art runs in the family (both of her brothers have done art degrees), and Alex can now trace this back across her Latvian relatives. She currently has very strong connections to Latvia and her newly found Latvian family, and communicates with them on a regular basis, sending and receiving gifts and photographs, and visiting on an annual basis. Yet, just ten years ago, Alex knew very little about her Latvian family. In many ways, they were a mystery. She was born in Birmingham in 1973 to a Latvian father and an English mother, and had very little contact with the local Latvian community. Her father had arrived in Britain in 1948, aged just four years old, with his older sister and mother, as a dependent on the ‘European Volunteer Worker’ (EVW) schemes. They came to join Alex’s grandfather, who had arrived in Britain in May 1947 to work in agriculture. 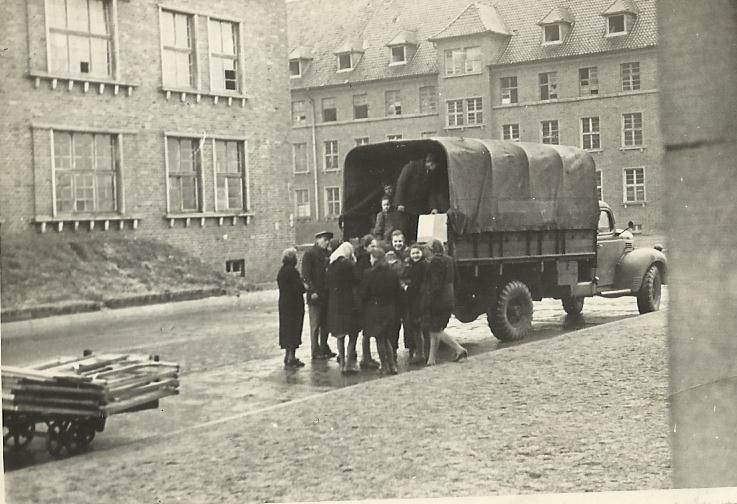 Like the other 25,000 Latvians, Lithuanians and Estonians who came to Britain on the EVW schemes between 1946 and 1951 to fill critical labour shortages, Alex’s grandfather had been displaced by the Second World War and the occupations of his beloved homeland by the Soviet Union and Nazi Germany. Although her father had been brought up in a Latvian-speaking household after arriving in England, Alex herself was brought up in a largely English-speaking home. Her Latvian grandmother died before Alex was born, and her grandfather passed away when she was just eight years old. “My father and aunt were involved in the Latvian community in England, but as the years passed and people passed away, life in England took over. The emphasis was on bringing up the family. Latvia was important it was always made clear, but when my grandfather died, my father stopped speaking Latvian… he had no-one to speak to and I stopped hearing it at home”. Like many other families, Alex’s family rarely spoke about their experiences of displacement. As Alex explained, “my family didn’t talk about the past. My father was one of five children. Only two made it to England. With losses like this, it’s too painful to talk”. Another aspect which weakened the second generation’s connection to their parents’ homelands during the 1970s and early 1980s, was the lack of information coming out of the Baltic states. It was almost impossible to search for family members at that time, and archives were either closed or difficult to access. Those who did try to communicate with family in their homeland found their letters censored and sometimes going missing. The few that did venture to Latvia, Lithuania or Estonia had to travel on ‘Intourist’ tours (Intourist was the Soviet travel agency) and were routed to popular tourist sites, and closely monitored on visits to family members. A few were able to meet up with family though, and gradually, slowly, links were re-established. Most of the second generation were also fully integrated into British society, attending British schools, having British friends and participating in British social activities. Many were uninterested in the activities of the Latvian, Lithuanian and Estonian organised communities, and a few describe feeling resentful at being dragged to event after event. A minority of the second generation were more involved and enjoyed participating in community activities, but the majority were not. During the 1970s, the decline in participation in the organised communities in Britain caused by a combination of an ageing first generation and a largely uninterested second generation, began to be addressed by some of the communities. In 1978, the Lithuanian community began publishing a newsletter for the second generation, called LYNES (Lithuanian Youth News-Sheet) which ran articles in English. After lengthy discussions, the Lithuanian community agreed that the second generations should form their own organisation which served their needs, rather than those of the first generation. In 1981, the Lithuanian Youth Association in Great Britain (Didžiosios Britanijos Lietuvių Jaunimo Sajunga – ‘DBLJS’) was formed, with its constitution declaring that “The languages of the DBLJS are Lithuanian and English”. The Latvian and Estonian communities also formed youth associations; the Estonian youth association was aptly named Tulevik, meaning ‘The Future’. Activities included organising sports teams and events, social evenings and summer youth camps. However, it was not until the excitement surrounding the prospect of independence for their homelands that many more of the second generation became interested. From the late 1980s onwards, due mainly to the policy of glasnost (‘openness’), more information began circulating in Britain about events in the Baltic countries. Many of the second generation shared in the excitement surrounding the restoration of independence and accompanied their parents to celebratory events in the communities. There was a sense of renewed vitality across all of the communities and in the years after, the second generation became increasingly interested in the homelands of their parents. However, Astrid and many others like her, were at that time busy with their careers and bringing up young families, and unable to attend organised community activities on a regular basis, and there were few other channels through which to express their growing interest. At the time that the original research for this project was carried out in the mid-1990s, the internet was in its infancy, and not available as a tool for research or for connecting with the Latvian, Lithuanian and Estonian communities. At that time, email was only just beginning to be used as a method of communication, with Hotmail being acquired by Microsoft in 1997 and quickly becoming one of the most popular webmail services. Internet search engines such as Google did not exist (Google was founded in 1998), and the first edition of Internet Explorer was only released in 1995. Although the internet was still in its infancy through the 1990s, the subsequent decade saw it explode. This has been a huge factor in stimulating the interest of the second generation and importantly, providing channels for this curiosity to be stimulated and furthered. It has also enabled much easier communication across the second generation, with other communities in Britain, with the first generation, and across the world. In 2004, the social networking giant Facebook was established. Like many others, I joined Facebook several years later in 2007, and over time have been able to use the expanded features that were introduced. In 2010, Facebook overhauled its ‘groups’ feature, which enabled the easy formation of special interest groups. It was in this context that the many Facebook groups such as Baltica and the Lithuanian Genealogical Society have formed. Facebook groups have become the most popular way to share information, and they have also enabled a much more open discussion of history, including some controversial aspects of these histories, which is such a huge contrast from the Soviet days. Facebook has enabled many friendships to form among the second generation, and enabled people who do not live in areas with large Latvian, Lithuanian and Estonian communities to connect with these communities. Some of the most popular Facebook groups include the Lithuanian Global Genealogical Society, which has over 6,000 members; Baltica and Old Latvian Photos, both with almost 3,000 members; and Latvian Genealogy, with almost 2,000 members. Over the past decade, the digitisation of archives has also facilitated easy online access to an array of resources across the world. The availability of information relating to family history and genealogy has in recent years also grown at a phenomenal rate. Websites such as Ancestry.co.uk. FindMyPast.co.uk and CyndisList.com have enabled easy perusal of online sources; many of these sites have special sections relating to the Baltic states. Due to the enormity of the task of digitisation, most archives still have a long way to go in the process. For example, the National Archives in London, where I did most of the documentary research for the book, has only a very small percentage of the documents I consulted available online. They have vastly increased the amount of documents that can be referenced online, allowing the user to request paper copies of documents at cost, but again, very many materials have not yet even been referenced. This has meant that in some instances, archives still need to be visited by foot and files explored in the old-fashioned way. Travel has also become easier and cheaper, and many members of the second generation have taken the plunge in recent years and visited Latvia, Lithuania or Estonia. Visiting members of the second generation have explored museums and cultural sites, visited the villages and lands of their family and ancestors, and experienced the culture of their homelands first hand. It was within this context that Alex Māzers has been able to satisfy her growing curiosity about Latvia and solve the mysteries surrounding her father’s Latvian family. Although her father and grandparents rarely spoke about Latvia, Alex’s aunt Jenny (Eiženija), who had also arrived in Britain in 1948, aged 18, did talk about the country. Alex was enthralled. It was through her aunt that Alex picked up fragments of information about the family’s past and so gained a vivid picture of interwar Latvia. One of the main mysteries surrounding the family’s displacement was that nothing had been heard from Alex’s two uncles (the brothers of her aunt and father) since the war. The family had no idea what had happened to them – or even if they were alive. Alex’s great-grandmother had been unable to come to Britain as a dependent and had ended up in Sweden, and the family had had little contact with that branch of the family either. After Alex’s aunt died and her father retired, Alex decided to try to find the answers to the missing pieces in the jigsaw of her family’s history. By now it was 2012, her son was a teenager and she had a little more time on her hands. She began to look for information online and joined relevant Facebook groups, asking questions and recording fragments of information that she could find. Alex put hundreds of hours into her project and it was a slow, and often frustrating process. Promising leads led to dead ends, and at times, answers seemed impossible to find. However, she persevered and finally found the answers to her questions. One of her father’s brothers was still alive and living in America. She was also able to link up with her great-grandmother’s family, who were found to be living in Sweden and discovered many new family members. The icing on the cake, however, was finding family in Latvia, including her father’s cousins and other members of her extended family. Again, letters and photographs were exchanged and trips to Latvia planned. Alex visited Latvia with her father in 2014, for the first time since he had left in 1944. It was an emotional experience, and almost as soon as she came home, they arranged the next trip, this time also taking Alex’s son. All three generations visited the old family farm and land with their new-found Latvian family. This year (2017) Alex visited Latvia again with her son and stayed with her father’s cousin Baiba at her home in Jūrmala. She now feels fully connected to her Latvian family and her father’s past, and has also nurtured in her son, a new interest in Latvia. Her father has weekly telephone conversations with his brother in America, and barely a week passes, without contact with their family in Latvia. Alex’s journey is mirrored among many other families in Britain and across the world, and has been greatly facilitated by the internet, which now hosts vibrant and active Latvian, Lithuanian and Estonian online communities. Some traditional community organisations in Britain have also been revitalised by recent migrants to Britain, since Latvia, Lithuania and Estonia became members of the European Union. Although the two communities are separate in many ways, they do also come together at times – for instance, at the annual St John’s Day celebrations at the Latvian retirement home Straumēni (Catthorpe Manor) in Leicestershire. Another second-generation Latvian, Sarah Dauksta, described how, at the midsummer celebrations at Straumēni, the new generations from Latvia are becoming increasingly interested in their country’s past and the journeys of the thousands of refugees forced to leave during the Second World War. At the Midsummer celebrations, Sarah chatted freely to more recent post-EU migrants, and they shared stories about their experiences and their families. The huge upturn in interest in this subject in recent years among the younger generations of Britain’s Latvian, Lithuanian and Estonian communities is a positive development. It has been amazing to witness the journeys of many second-generation Latvians, Lithuanians and Estonians in Britain and across the world, who are finding so many answers to their questions about their family history, and to see the connections made with others in similar situations. I hope that my new book, Rebuilding Post-War Britain: Latvian, Lithuanian and Estonian Refugees in Britain, 1946-1951, will provide the context within which individual stories can be better understood and will contribute to an improved understanding of Britain’s Latvian, Lithuanian and Estonian communities and their fascinating histories. Emily Gilbert did her PhD about Latvian, Lithuanian and Estonian European Volunteer Workers in Britain in the mid 1990s at the University of Sheffield, and after a nearly twenty -year gap decided to publish it a a book. Rebuilding Post-War Britain: Latvian, Lithuanian and Estonian Refugees in Great Britain, 1946-1951 was published this year by Pen and Sword publishers. She is not Latvian, Lithuanian or Estonian herself (she is often asked) but has had a fascination with the whole Soviet Union, Russian, Baltics and East European region since being a teenager, and has travelled widely around the region.